Cowgirl | MWAH! S&P Shakers Figurines | One Price Low Flat Shipping! 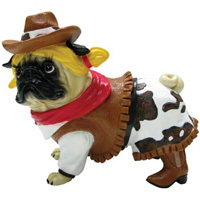 This pug figurine has her long blonde hair in pig tails and is wearing a brown leather vest, cow-print skirt, red handkerchief, and cowboy hat and boots.